We create a magic with every plate crea magia en cada plato! Be inspired and dig in to these mouth-watering recipes your taste buds have been craving. Tapeo Café & Tapas is located at the centre of Beckenham High Street. We are just a 7 minute walk from Beckenham Junction Rail and Tram stations. The area gives you that village vibe, whilst offering many exciting independent shops and restaurants alike. At Tapeo, every detail (no matter the effort) is essential, from the cosy space and inviting funky lights, to our comfortable seating and warm gracious service of our staff. Whilst what is served on the plate is the highlight, we know that the experience should be more than just a cuisine. The restaurant itself is an ideal meeting ground for young people, friends, families and will easily win the hearts of anyone who happened to find us! Tapeo is our home and you are our honoured guests. Mixture of classic and modern takes on Traditional Spanish tapas. At Tapeo, we like to think that we create magic with every plate, or “crea magia en cada plato!” Starting with the very best ingredients, we create dishes that inspire a sense of satisfaction and awe. We use quality imported ingredients from Spain, as well as utilizing locally sourced and fresh seasonal produce, delivered to us everyday by the best suppliers in the UK. Soak up the Tapeo atmosphere! From pulling up a bar stool at our relaxing bar to conversing by our poseur rustic barrel tables. Sample a glass of refreshing Strawberry Rose Sangria or Sherry with some picoteos to nibble. Order your food when you are ready, pair your dish with the perfect wine carefully chosen by our sommelier from a wide range selection of quality Spanish wines. Pop a bottle of Castellroig, Brut Gran Reserva or Cava to celebrate an occasion, or simply enjoy a glass with tapas or after work drinks with friends and families. We offer table service. Bookings are accepted as well as walk in (when available). Our brunch is served 9:30am to 12:00 noon while tapas menu is available from 12:00 noon to 11pm. We cater for parties or group bookings. We take great pride in sourcing the very best authentic ingredients for every dish we serve. In the kitchen, our four talented and skillful chefs marry precise culinary technique with loving respect for our ingredients. One of the most popular menu items is “Jamon Iberico”, of which is processed from Iberian black pigs left to roam freely in the oak forest and fattened on acorns. 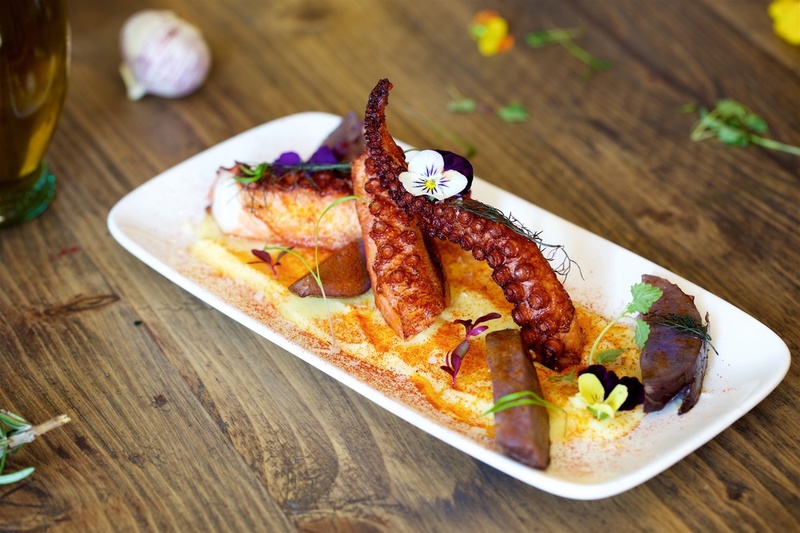 Our menu consists of a mixture of classic and modern takes on traditional Spanish tapas. Offering a fantastic variety of picoteos, charcuteria, cheese, meat, seafood dishes and an extensive vegetarian menu. Our sommelier - Eduardo - crafted a great wine list to perfectly match our dishes. The kids will not be left out either as we have a menu specially created for them. We also offer DAILY TAPAS SPECIALS precisely created by the chefs to showcase the seasonal fresh produce that is locally, and internationally available. Dine, relax, socialize and share great experiences.